Well, hello there. It is Monday, and it is time to bring you another backstory from one of our Season 2 characters; Riptor. Well, technically the clock on my laptop says 12:29am, but I am sitting 30,000 feet in the air, sipping on my adult beverage of choice, trying to not pay attention to the fact that my airplane is dancing across the sky…violently. Since we’re being technical, let’s continue that trend, shall we? Ignoring this turbulence as best I can, my mind is focused on home, where it is currently still Monday night, and approaching the late hours of the night. Still, again, Monday. In my mind that counts! We managed to publish on Monday. Riptor’s story was just delivered to my inbox minutes ago (on Monday, might I add), so that means it’s time to pass it your way! Give it a read below. This is the copyedit of the Riptor Unit quick start guide (to be published in second quarter of fiscal year). All comments are from Ultratech Legal [UTL] and Ultratech Marketing [UTM]. Congratulations! 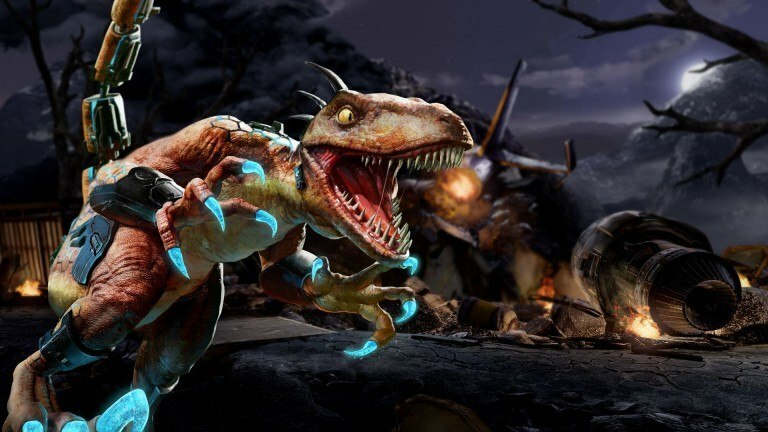 You’ve bought yourself a Riptor Unit! Your adventure has just begun! It is a living and breathing example of American ingenuity! Good luck! And go Ultratech! You’ve probably already realized that your Riptor unit eats a lot! This hungry lady consumes about 5% of her body weight daily (up to 50 lbs of meat). That’s a lot of live goats—the preferred Riptor diet. [UTM: Include official link in e-book version to online page for the “Goats On Time, Anytime” Ultratech livestock purchase form.] The most important thing to keep in mind at feeding times are the 3 R’s: Respect, Risk and Reaction Time. Let’s start with the first one. Risk: There is inherent risk at feeding time. The Riptor will be incredibly excited about the prospect of eating. Their internal clocks are highly accurate, and they don’t like being hungry. It makes them edgy and irritable. Never look directly into your Riptor unit’s eyes at mealtimes. Their gaze is hypnotizing and this leaves you open to attack. It’s always best to wear your Ultrafyber™ Feeding Gauntlets[UTM: Nice! The Quick Start Guide needs more cross-promotion of UT products like this.] when pushing goats into the armored feeding bins. Riptors have been known to rip through the metal slot bars in a frenzy to get at their dinner. That’ll do it for this week! We’ll let you get back to your evening…err…late night, and I’ll go back to reminiscing about the wonderful weekend which just passed that included PAX South, the incredible KI World Cup, Kim Wu’s reveal & trailer, and of course…that tease! While you’re here, drop by the forums and let us know what you think of everything. Catch you again next week.